Just weeks after the deal was first announced, the owners of Berkshire East Mountain Resort have completed their purchase of Catamount Ski Area. According to the quitclaim deed filed with the Southern Berkshire Registry of Deeds on Friday, Catamount Ski Resort LLC acquired the property from Catamount Development Corporation for $650,000 while also assuming $1,644,275 in outstanding debt, for a total of $2.3 million. James Schaefer and Jonathan Schaefer of Berkshire East are the registered managers of Catamount Ski Resort LLC, according to the Massachusetts Secretary of State. According to a press release issued earlier this month, the Schaefers are planning to construct a new base lodge at Catamount this summer and are looking to introduce more off season activities, consistent with the business model they introduced at Berkshire East. Berkshire East currently offers lift served mountain biking, zip lines, ropes courses, a mountain coaster, whitewater rafting, and a wedding venue, in addition to the core ski business. Berkshire East also has a wind turbine and solar array, covering the ski area's energy consumption. According to the press release, "Berkshire East and Catamount pass holders and guests will receive different levels of reciprocity in both the winter and summer months." Berkshire East primarily draws from Western Massachusetts and Connecticut, while Catamount draws from New York. Both areas feature vertical drops of roughly 1,000 feet, served by modern fixed grip quad chairlifts. The Schaefer family has owned Berkshire East since 2007, when Roy and his son Jim bought out Union Terminal Piers' stake in the area. Roy Schaefer and Union Terminal Piers had owned Berkshire East since the late 1970s. 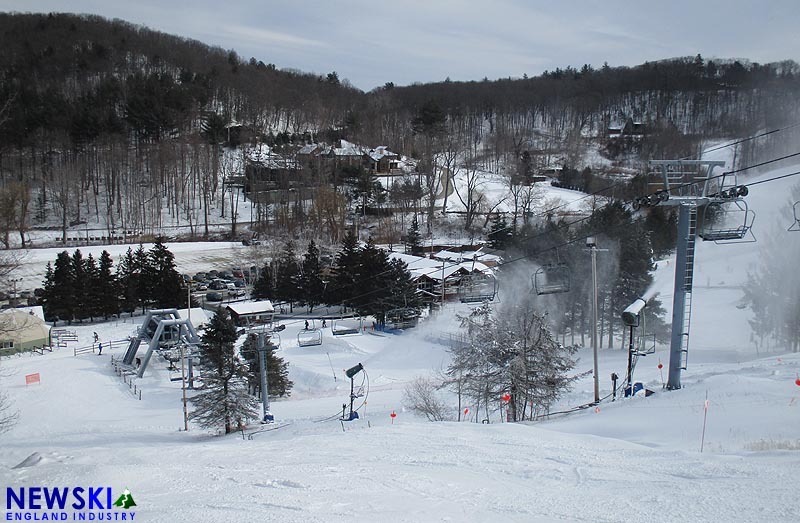 The group also owned and operated Cannonsburg ski area in Michigan and briefly operated Berkshire Snow Basin in Massachusetts. Catamount's present ownership group acquired the ski area in 1973. A major timeshare and mountain development deal fell apart in 2015 after legal challenges from a local lodging facility. Owner Bill Gilbert passed away in 2016. With the Catamount deal, four groups now own the seven commercial ski areas in Western Massachusetts, as the owner of Ski Butternut acquired Otis Ridge and Blandford in recent years. Bousquet is currently on the market. June 1, 2018 Update: Attorney William Martin of Pittsfield told the Berkshire Eagle the total sale price was $3 million, when including a property transaction in New York and additional assets.